What should be done to tackle missed GP surgery appointments? Missed GP surgery appointments are costing the NHS at least £180m each year, according to a survey of doctors. The report by the Developing Patient Partnerships found that forgetfulness was given as the main reason with 70% of GPs claiming they would consider removing persistent offenders from their lists. Most of the 683 surgeries surveyed said patients should be charged for missing an appointment. What action should be taken over missed appointments? Should a system of fines be introduced? How should we tackle missed GP appointments? Patients missing GP appointments should be issued with a fine, and if they continue missing appointments even steeper fines should be issued. These people are wasting our money and should be charged for the missed appointment. Those people who are on benefits could claim back the cost of the appointment, as long as they attended the appointment. Patients should definitely be charged for missing appointments, and anyone who misses them more than three times should have his/her name temporarily removed from their GP's list. 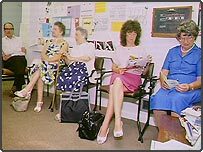 I think a good idea would be for all GPs surgeries to drop the appointments system and have a "walk in" system, whereby anyone wanting to see their GP should turn up during opening times. Thereby, only people genuinely in need of a doctor will be seen and those that can't be bothered to attend won't fail their appointments. Also, it would ensure that people genuinely ill and in need of treatment will be seen on that day and not have to wait a few days until the next available appointment. My dentist sends me an automated SMS two days prior to my appointment. Can't the GPs do that too? This way people will either remember or cancel their appointment in time. I really feel sorry for the doctors but, unfortunately, by the time you wait on an appointment, the condition has probably gone away on its own and it is easy to forget to cancel the appointment. Although the UK is very proud of the free health service, in all areas in life you get what you pay for. I have experience from France and Sweden, where service is superior to the UK and you have to pay £10-15 for an appointment. This is a good idea as it will help to reduce the UK policy of "in and out of the surgery in two minutes since we have no money" and people ignoring appointments. I got a letter from my doctor complaining about my failure to turn up for an appointment. An appointment I had cancelled. I wouldn't trust the figures as being in any way accurate. We've all been there, sitting in the doctor's surgery waiting for an hour to be seen. There is great demand placed upon GPs and people who make appointments which they don't keep are plain selfish. If you can't make an appointment, all it takes is a phone call to let the doctor know. These people take up a slot in the appointments list which someone in more need could have had. Fines should be introduced and persistent offenders removed from the list. Fining people is an ill-conceived idea - people are normally seeing their GP as they are ill, fines will hardly contribute to improving their well-being. Who would carry the administrative burden of chasing fines and decide what happens when someone will not or cannot pay? Let's keep the issue in perspective - the majority of people keep their appointments, or have the common decency to ring and cancel. 10 million missed appointments is a lot, but there are 60 million people in the UK. This means that at least five out of every six people kept all their appointments last year. Let's try to improve, but keep the problem in perspective. If I miss an appointment with my dentist and do not give 24 hour notice, I have to pay. Make people pay who stay away without proper notice unless there is a real cause for missing an appointment. Let each surgery keep these fines to cover their losses due to missed appointments. I had an appointment at my local GP practice which I cancelled 1 week prior to the appointment. I then got a letter telling me I hadn't turned up for the appointment. To redress the balance of comments on this page, so far, my surgery has always provided me with an appointment within 48 hours. They are very efficient. Perhaps an answer to the problem would be for doctors to give the last appointment of the day to the habitual late-comer and give them a time limit. Then if they don't show, the doctor can get ready to go home (on time) and not inconvenience anyone else. Here in the US, I've always had a reminder call the day before or morning of each appointment. It isn't difficult to return the courtesy and pick up the phone if you can't make your appointment. My doctor's surgery runs a mixed open surgery and appointment system. Open surgeries in the mornings, appointments at other times. It works well and means that if you wake up feeling ill you can be seen without any hassle at all, although of course you have to wait your turn, but it is never an horrendously long wait. In addition although the doors open at 8.30, the phone is answered from 8.00 a.m. It works! The standard of service from doctors and surgeries is without doubt, getting worse. You will be hard pressed to get an appointment to see your regular doctor within a week. Even then, the general opinion appears to be wait until the problem gets worse or fixes itself! Getting a timely diagnosis is often regarded with hilarity! I suspect most people just get fed up of the constant re-appointments for things that should be sorted in one appointment, and so stop attending. Some patients report they cannot get through to the GP surgery to cancel their appointment, could the practices have a dedicated cancel appointment line and also offer an email address. Automatic charging for missed appointments will not help those people who in times of stress or bereavement do forget to cancel. GP practices could send appointment confirmation and reminders by email to those who sign up for such a service. I work in a GP surgery. We recently changed our appointments system so the longest wait for an appointment is 48hrs. After 18 months this has made no impact on our non-attendance rate. Surely people don't forget over 24/48 hrs. Forgetfulness is not the main problem but lack of respect and courtesy. I took my father for an endoscopy at the local hospital and we sat and waited with a woman who was terrified of the procedure. She'd been kept waiting for ages and was in an extremely agitated state. None of the staff made any attempt to reassure her, and she repeatedly said she couldn't face it and was going home. The person she was with tried to calm her down and we also tried comforting her. She did eventually have the endoscopy and got through it ok; but it was harrowing to see what she was going through. The medical profession don't seem to realise that what is routine for them can seem terrifying to patients. How many missed appointments are by people whose nerve has failed them? Patients missing GP appointments or any NHS should be charged £15-£20 if they do not cancel in advance. I don't visit my doctor often, it's got to be serious for me to take time out to do so. Those who miss appointments obviously have their priorities all wrong and should perhaps think twice before actually calling the surgery in the first place. Why don't GP's get with the 21st century and allow people to book appointments online and then receive an email reminder the morning of the appointment? As a doctor there are many times throughout the week when I have patients not turning up and there are I'm sure some valid reasons but there a lot of people of whom are persistent in not turning up and I would feel that having fines for not turning up for an appointment should be in place. I have had to put people off my register for taking up too many appointments and failing to turn up. I feel that this is a very positive step. If this is known then people will turn up. I have noticed a lot of suggestions about people just turning up, for many GP's that's just not possible, My GP department has around 6 GPs and around 1000 patients, if we allowed them to just turn up then there would be major problems. Why don't the surgeries do what they do here and call to remind patients of their appointment the day before? I can think of at least two occasions where this has stopped us from offending. The wait time here is the same as it is in the UK for non emergencies. This comes down to common courtesy. We are told time and time again that hospitals and doctors surgeries are stretched to breaking point. I appreciate that there are going to be the odd occasions when missing an appointment is unavoidable and it is not possible to let the surgery know. But how many of these missed appointments are for genuine reasons and how many are people just being plain inconsiderate? If you get people that repeatedly make appointments and fail to turn up without phoning in advance then quite right that they should be charged or even told to leave. I am not surprised at the number of missed appointments, at our GP surgery it is quite normal to have to wait 6 weeks for an appointment with a doctor of your choice. Therefore by the time the day arrives you can feel quite well and forget to cancel or attend. Even to see one of the less popular GPs a wait of over a week should be expected. There is a way to dramatically reduce missed appointments - we have been shouting about it for years now - text message reminders. We have a series of applications which are specifically designed to help reduce missed appointments. 56 million people have a device in their pocket capable of getting the reminder. When will someone have the courage to overhaul this national dinosaur? This underlines the whole problem with the general public and the NHS. Anything billed as free is perceived to have no value and hence it is abused. Dental treatment is not free at the point of delivery, nor is a GP visit which results in medication. When will someone have the courage to overhaul this national dinosaur? I missed an appointment once - after waiting 3 hours in the waiting room, I told the receptionist that my husband needed our car and I had to leave without seeing my GP. How many of these 15 million missed appointments are due to the GP's long lunch break forcing waiting patients to leave without being seen? Primary care management is atrocious and GPs increasingly don't even understand the action of the drugs they prescribe. I have recently had two elderly relatives, who required prolonged hospitalisation as a result of inappropriate drugs prescription by different GPs. Maybe I'm being naive, but how do these missed appointments cost extra money and cause extra workload? I'd have thought that if the patients actually turned up, then they would cause more work not less and might be prescribed medicines which would cost more money. When an appointment is missed, does the GP/nurse sit there twiddling their thumbs for 10 minutes? Of course not! It gives them the chance to catch up with their over-running surgeries due to over-booking in the first place. Imagine how much longer the delays would be if all the patients turned up! Some illnesses make it more possible to forget appointments. This would include early dementia and also painful illnesses and those that require heavy drugs. Also illegal drug use can cause the kinds of problems that can lead to absent mindedness. Also people with mental health problems could have genuine difficulties. People missing appointments regularly for no good reason could be fine, but allowances should be made for people with particular difficulties. You should be given one chance a year to miss an appointment and charges should be set for all other missed appointments like they do at the dentist etc. Here in Luxembourg, patients are warned that they will be billed for a missed appointment. As a GP it is very frustrating that patients do not attend appointments as it prevent others from using that appointment instead. It is not the GP that suffers it is other patients. Organising an electronic system of reminders raises confidentiality issues and the bottom line is that at some point people have to take responsibility for their actions. If they have a health concern the very least they can do is be responsible for attending an appointment. As for GPs being 'late' seeing patients, when I run late it is due to spending extra time with patients who need it. You cannot simply treat many serious illnesses in less than 10minutes! It can be irritating when I turn up on time for an appointment to be kept waiting for an hour for something that may only take a few minutes to sort out, but I try to adopt the philosophical approach that it's better than being one of the unfortunate people who need more of the doctor's time. It also keeps the blood pressure down in case that gets checked! It takes ages, sometimes, to get through and book an appointment in the first place. Sometimes there's a wait of a week before you can see a doctor. Our daughter was suicidal, but she was told she'd have to wait for 5 days for an appointment. It was only because a doctor happened by that she was seen immediately. Most receptionists are great, but sometimes you'd think they were bouncers, or GPs themselves! Yes, it's appalling that some people have no manners to cancel appointments, but it works both ways! In the USA, when a patient misses an appointment, they are charged for missing or cancelling an appointment. Unfortunately, such a system is not flexible when it comes to people without money. I 'missed' an appointment once - unfortunately the medical centre failed to send me an appointment time. By the time I found out, I was just another statistic. It is still on my medical record with my doctor. The answer - enable people to book times that suit them; why I have to wait for an appointment to be scheduled to suit the work-life balance of the medical profession is quite amazing. The patient must choose the time, and then must pay for missing it. The current situation offers no value to anyone other than those enjoying an overgenerous work-life balance. Surgeries in South Africa are far more consumer friendly. They are not only open during office and school hours. They stay open till late - my doctor closed at 8pm, they are also open on Saturdays. In a practice where there are a few doctors, they can easily work shifts to accommodate their clients. We also mostly get the same doctor, they know your history and it's a lot smoother. I think people should be fined for missing appointments. Threats don't work, hurting the pocket does. My last GP had a system that you could only make an appointment in the morning of the day you wanted to visit. I thought this was great as if you have to book two weeks in advance it is reasonable (as a busy person) to forget, booking it in the morning meant it was fresh in your mind. They did not wait for people who were late but attended to those already there, latecomers were merely shifted down the timetable. This is the only doctors I have been to where the appointments were very close to being on time. The changing of the appointment system so that you can't book a time beyond 48hrs is just a fiddle to meet the government waiting time target. I work for an out-of-hours GP service, which is increasingly being used by people as an extension of their own surgery, which is not what it is there for. Lots of the doctors time is spent seeing or talking to patients who have had the symptoms for weeks and have not or could not get to see their doctor, so the GP appointments system has a knock-on effect on other services and the genuine emergencies have to be dealt with alongside the routine stuff which could easily wait. I work in a GP surgery. We recently changed our appointments system so the longest wait for an appointment is 48hrs. After 18 months, this has made no impact on our non-attendance rate. Surely people don't forget over 24/48 hrs. Forgetfulness is not the main problem but lack of respect and courtesy. I work by a very small local doctor's surgery where patients don't even have to make appointments, they just turn up and wait to be seen and this works fine. It's a shame the bigger surgeries can't organise the appointments, doctors, waiting times better and therefore reduce the number of missed appointments. But saying that, it's just plain good manners that you inform the relevant people if you have to cancel an appointment. Why do we not just make it easier to make appointments, online booking, text etc thereby leaving the telephone more available to the people who do not use those communication forms? When someone fails to turn up especially if booked on line and an automatic reminder has been sent in advance then after the third no show they have to secure an appointment with a credit card. Monies to go direct to the practice for provision of better facilities within the practice. A couple of charges and people will either stop making appointment for trivial matters or remember to turn up especially if they have been reminded! In my doctor's surgery there is a warning notice to say that people who habitually miss appointment (and there are quite a few) will be struck off the surgery's list. It has made a definite difference. The surgery is very strict over it but is fair. They do make allowances for traffic delays etc. Only a few people have been struck off and although there are occasions where the surgery overruns because people don't turn up, it doesn't happen much anymore. How about charging the failed attendee for the wasted time? My wife works for the NHS (not a GP but her area operates an appointment scheme). People who fail to turn up regularly are put to the end of the waiting list (which they could have waited for over a year to be on). They are warned by letter after each failed appointment. I fully agree that people should have some sort of penalty for wasting the time and money of our health service. How about charging the failed attendee for the wasted time? How about introducing a joining fee - with an amount to be deducted each time an appointment is missed without good cause? I am a GP and this is part of a wider problem. We run late because some people's problems are serious and complex, because people go on-and-on raising everything they can think of under-the-sun, because whole families turn up, because you have to state at length why it is not possible to prescribe drugs for export abroad, because you have to explain at length why signing a sick note for them is improper and would involve you in fraud for which you could be struck off, because they visit you 80 times a year to tell you they are not happy with their lives, because they come back days after day for a cold no matter how long and detailed an explanation you give and so on. The patients have rights but absolutely no responsibilities and this has a profound and damaging affect on the service in my view. While they may have valid issues regarding cancellation of appointments, whenever I try and contact my surgery I can never get an appointment with 4 days. Staff are often rude and unfriendly which probably is a reason why people don't bother calling back. If they upped their attitude toward patients, maybe patients would amend theirs. Why not issue x number of credits per year that allow you to get immediate appointments, and you can decide when to "cash them in". Its not just the patients that miss appointments, doctors do too. I recently had an appointment at my local GP's surgery and was seen over an hour late - not funny if you've then got to explain to your boss why you are late for work. If they start charging patients for missing appointments, will I also get compensation if my GP is late for his own appointments? I think not! I've just phoned my GP for the 3rd time, since last week. I need an antenatal check up but I still can't make an appointment! I've been told to ring again on Friday when more appointments are released. Every time I go there is a display indicating how many people missed appointments last month, which was 67 the last time I looked! I am a British GP presently in Canada and I am in an under serviced area. Miss three appointments, receive a bill for $40 and a warning that you will be asked to leave the practice next time. I have voice mail to leave cancellation messages. Yes, I can run late but emergencies happen, more time is often needed and I can guarantee to see someone who cannot wait within 24 hours, usually the same day, urgent cases immediately. Trying to get back to the UK to work as a GP is another story. To the "Anonymous" British GP working in Canada. I too am currently living in Canada and haven't been able to get on any doctor's list near my home for over a year. They always say they are full. It's not all great here - at least in the UK you can join a surgery. There should be a sliding scale, nothing for missing one, then increasing fines, and finally persistent offenders should be excluded from the NHS for a significant time, five years should do. I had a practice nurse appointment at 08.15 on Monday. We had a flood in our flat when I woke up, which meant that I would miss the appointment. When I called the surgery to let them know, I received a voicemail stating that the switchboard wouldn't be open until 8.30....what was I supposed to have done? As someone who has worked in clinics before, I see both sides of the coin. I think people should be fined for missed appointments. People should take the responsibility to phone in and cancel if they don't intend to show up. This would cut waiting lists, since other people could have those appointments. But also if doctors turned up on time and stuck to schedules, patients wouldn't spend so much time waiting. I think a bit of 'give and take' is needed here. The most obvious way to avoid cancelled appointments is not to make them in the first place! Where I live you do not make an appointment, you just turn up. It works well, and there are no plans for this to change. Why can't other surgeries operate the same way? How do missed appointments cost money? And why can't I get an appointment at my GP within one working week? I think this shows that a lot of people make appointments for trivial reasons. Maybe GPs should introduce a notional charge for appointments, refunded if the person attends. If you don't prioritise your health over work then how can you except your GP to? Perhaps if you didn't have to book an appointment two weeks in advance of wanting to see a doctor, people wouldn't forget they'd made the appointment or gone to the trouble of recovering before the appointment. In my work I regularly have to ring GP surgeries. Pressure of appointments means that it can often take 5 minutes to get an answer or over 20-30 attempts to get a ring tone. Only the most determined is going to put up with that when cancelling an appointment. Why do GPs not introduce a text message reminder service? Spending 10p to prevent the loss of an £18 appointment is surely a small investment to make. The vast majority of patients will own a mobile phone, and could receive a text message one or two hours before their appointment. An automated database system could send out the messages without the need of any additional human input beyond that of adding the appointment and maintaining accurate patient records. Some hospitals and practices do use text message reminders. A recent study shows they've proved particularly effective in mental health. However, there is a duty to protect patient's confidentiality and text messages don't provide guaranteed delivery, nor can surgeries or hospitals be sure that only the intended recipient will read the message. I am guilty of having missed an appointment before and believe the cause is partly the length of time between booking the appointment and the appointment itself. If you have to wait 2 weeks for your appointment then the chances are you will feel better by then and forget when your appointment was. This tale is symptomatic of the malaise within the 'free at the point of delivery' health service. The sooner individuals begin to take more responsibility for their healthcare - in other words start paying for it - the sooner people will stop taking the health services for granted. I used to be a practice nurse and missed appointments affected my workload. Although I aimed to see patients if I had time without an appointment, I feel that measures should be put into place to stop patients just deciding not to come to their appointments and wasting professionals' time. I used to live in New Zealand where people are charged each time they make an appointment to see their GP. That might solve the problem here. This report is unbalanced. I can't count the number of times I have been kept waiting, without explanation or apology, by my GP where surgeries have been running late or because the GP has simply not turned up on time for the first morning appointment. Patients have obligations towards GPs but the reverse is also true. As someone who always turns up on time for appointments and never seen on time I can't see that missed appointments costs are real. My GP habitually overbooks and on days without a substantial number of no-shows the surgery overruns. This is the norm and the only way I can be seen without a long wait is to book an appointment near the start of surgery. Missed appointments cost are just a smoke screen for a chaotic appointments system. There are a number of things that could help alleviate missed appointments. Firstly making appointments available to suit the patients - why do all appointments have to be between 0900 and 1700 Monday to Friday? I'm sure a number of people end up missing appointments because work, school and other commitments crop up. Secondly, make it easier to actually cancel - I'm not aware of any doctor's surgery or hospital out patients department where you can e-mail, or text a cancellation - why not? It's easy and cheap technology. At my GP surgery it can take nearly 4 weeks to get to see a particular doctor. Is it any wonder people don't turn up? They probably forget which day the appointment is actually for!